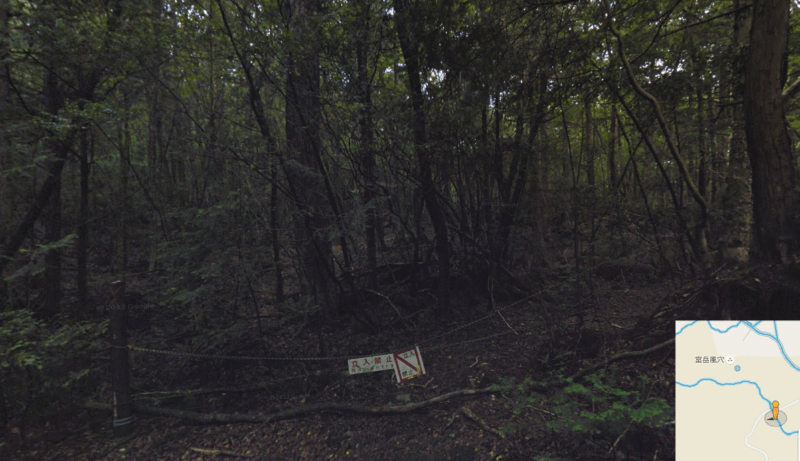 I’ve been contemplating on whether to write a blog post about my visit to aokigahara (aka suicide forest) when there are already so many blogs and videos about it but I kind of need to pen down my experiences in order to get them out of my head. Even as I type (2 months on), I can still recall the feeling of “deafening silence” and my anxiety level as I walked the simplest 20 minutes walking path (which in all honesty, was far from what most braver people have otherwise done). Well, each and every person’s experience is different and I’m here to share my somewhat scaredy-cat experience. I kind of knew that such a place called Suicide Forest exists somewhere in Japan near Mt Fuji but my interest in Aokigahara was sparked off after watching this youtube video by Vice Japan. Then, I realised that I actually had a friend who made a visit to the forest alone and said that beyond all the creepiness that you read online, it is a beautiful and mysterious place. Just to share a bit more about my personality and fear level so you can understand more of my thoughts during my experience. I am not a thrill-seeker – In daily life, if I had a choice, I will not watch horror and ghost movies as I do not like scaring myself. As much as I think that I am adventurous, I have yet to explore any known haunted places before. The scariest thing that I have ever done (as far as my memory takes) was a confidence walk without lights at Matrichie in my younger days. It was part of a camp activity and I didn’t exactly have a choice. The next scariest was my visit to the Haunted House in Universal Studios Hollywood. That place scared the hell out of me with all that creepy sound effects. Would I dare to enter Aokigahara alone or at night with friends? Nope, I don’t think so. So.. with my somewhat weak fear factor, why will I want to put myself into the situation of entering a forest well-known for suicides? To be honest, I don’t really know but I grew curious about this forest overtime. 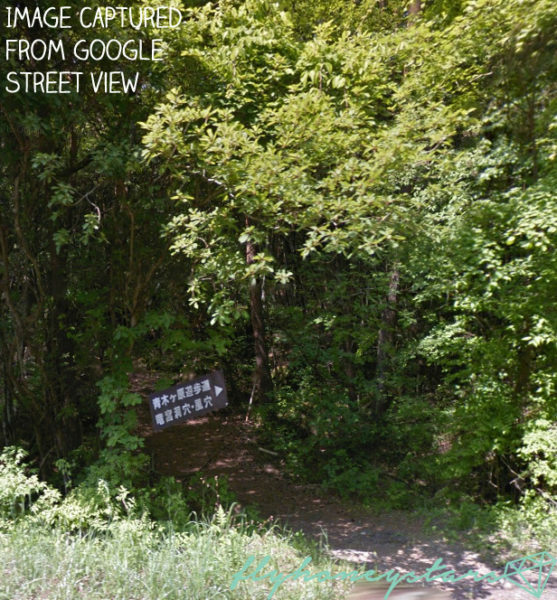 I started reading blogs about people’s adventure and watching videos of those who made it out alive (duh) and it kind of over-sensationalized my curiosity and there I was.. visiting Aokigahara on a random Sunday afternoon. The next amazing that that happened was that my traveling friend was willing to make the adventure with me. I kind of convinced her that it was gonna be an interesting nature hike. Well, I think she was pretty scared too (wouldn’t have done it without me). To be honest, it is not easy to find a friend who is willing to explore such places with you. After I returned from the trip and shared my experience about the forest, more than half of my friends/colleagues said I was crazy or “there are better things to do in Japan” and that they would not have accompanied me. Oh wells, I was lucky this trip. By the way, I followed the walking course from here. We boarded the Retro bus Green Line (30 mins frequency) from Kawaguchiko Station. Alight at Saiko Bat Cave after a 36 minute bus ride. There’s a huge carpark area and since it was a Sunday, the carpark was half-filled. I went over to the information counter to ask whether there were tours but the message couldn’t get across to the counter staff. We ended up telling him that we want to visit the forest (didn’t bat an eyelid; maybe I wasn’t alone) and he gave us a map and directed us to walk to the end of the carpark. Right. As we were reaching the end of the carpark, we spotted a group of Japanese with a supposed guide at the entrance. We thought that the group would be joining us in the forest after they were done with the explanation but nope – they didn’t enter the forest (or at least we didn’t hear them). Not wanting to waste any time (we were rushing as we wanted to visit the Pagoda later on), we entered the forest (just the two of us) alone, thinking that the guided tour will be joining us shortly. We were so wrong. The entire time we were inside the forest, following the official trails, there was no one else in sight. Where were all the people who parked their cars at the carpark? It was a Sunday afternoon and the entrance looked promising (with many cars) but we had to walk through it alone, similar to the experiences of those that I read/watched online. The forest was so eerily quiet that both of us started talking non-stop in order to keep our minds distracted from the deafening silence. It was bright daylight yet being surrounding by all these trees in a place with a dark history makes you wonder if you’re gonna lose yourself within it. Following closely to the guide, there were several landmarks you can spot. (Below) Unusual Japanese cypress tree shaped like a mythological eight-tailed serpent. To be honest, I didn’t want to take any photos as I was afraid that my lens would capture something that I didn’t want to see. When I took these photos, I only used my iPhone camera, keeping it quick and swift. I didn’t even review any of these photos after I took them. It was a snap and that’s it. I guess there was a lot of fear in me somehow. My friend didn’t even take a single photo while we were inside. That were all the photos I took in the forest. 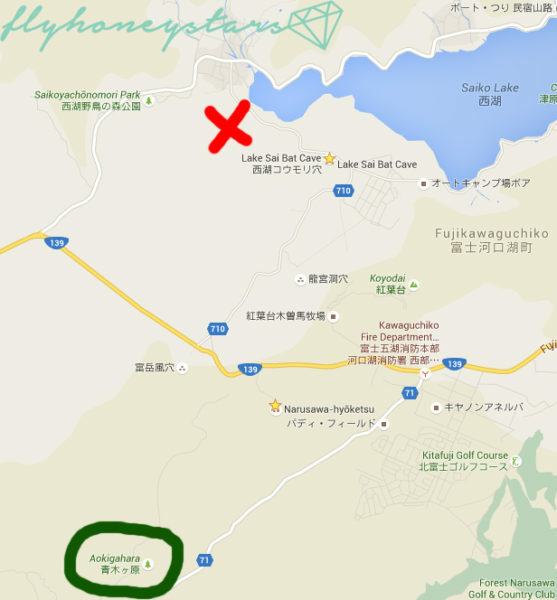 To be honest, the area that I trekked at (Red Cross), it is not exactly considered as part of the Aokigahara (Green Circle) according to Google Maps below. Not sure if I can even consider myself as a success but oh wells, it’s definitely a been there done that agenda on my to do list. Anyway, the exit of the trail was a little awkward and unexciting. Didn’t take a photo but I found this off Goggle Street View. Alright here’s a better picture for you to imagine. We were literally left stranded along the road after the exit. The annoying thing about this retro bus is that its timings does not show up on google map transport search. Thus, I was unable to route any bus stops around the vicinity. It was seriously like a panic moment as we did not know where to walk but my instinct told me to walk down the road as walking the other way would be a back-trek and I personally don’t like back-trekking. Along the road, we found a map which has fallen off the frame.. right.. Anyway, we ended up walking down some random dirt path (as seen below) because I saw that the lake was behind and I thought that as long as we see the lake, it should have a public transport nearby. Anyway, it was the correct path. We spotted.. another even more cui map. Doubt it was vandalism, probably weathering. Alas, we spotted some humans (first in the past half hour) and music from a family sitting down randomly on the road in front of the tattered map. To be honest, I don’t really remember my family sitting around randomly just like that. 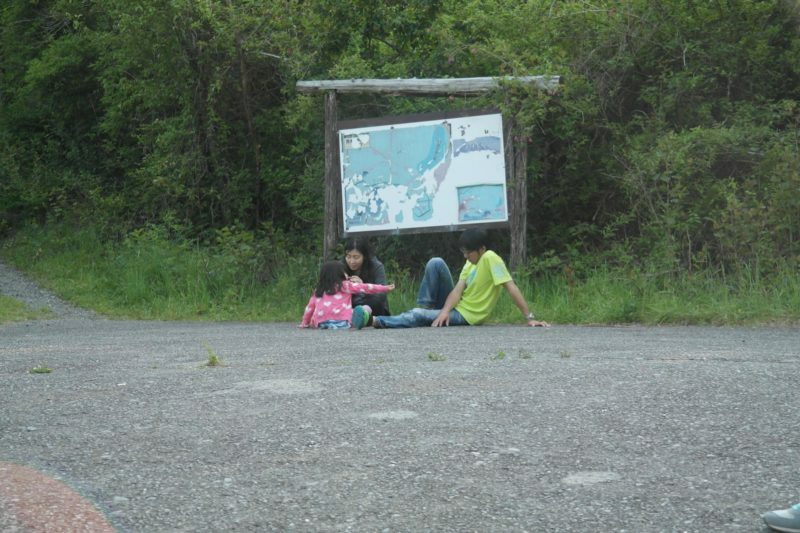 It really seems like they were there to enjoy the nature, the peace and serenity of the place. The last time I recall being “stranded” from the public was during the visit to lazarus island which was kind of isolated and away from everything and everyone else.. This scene left me deep in thoughts somehow. I was thinking hard on whether I can accept such a lifestyle after all. I haven’t found the answer..
We were glad and relieved to be greeted by Mt Fuji again! After the somewhat “terrifying silence” experience, we were glad to see something familiar again! More humans spotted! and what an awesome thing they are doing – enjoying the scenery while fishing in the lake. I guess these are what Sundays are about, something that I have sometimes forgotten to appreciate – the beauty of nature and its offerings. Maybe I could get use to these after all. We continued venturing along the roads (there were unoccupied minsuks or chalets, probably only operating in summer) and finally reached a main road.. Seriously, is there anyone at all? Thankfully, there was a map available for us to oriented ourselves and we waited at bus stop 67 for a while. Thankfully, it was like 16:00 and the last bus was 17:17 which means that we have 3 more buses before being stranded. The 16:17 bus did not arrive and we ended up flagging another Keio bus. We asked the driver if he was going to Kawaguchiko Station and whether the trip was covered by our Fuji Hakone Pass. It was positive to both queries and off we were in a random bus (which we have no idea what route it was on) back to the Station, marking the end of our suicide forest exploration. Anyway, I mapped out my walking path against Google maps. The blue circles with numbers represent the bus stops for the retro bus green line service. The red lines indicates my walk on that day while the brown lines are other trail paths marked out with referencing to their map. This is just a portion of the outer Aokigahara area and does not include the wind and ice cave which is further down south. Would I do it again? I probably would if I am bringing someone who is keen on visiting there. There’s some kind of mystery which will draw people back and I have yet to spot any “No Entry” sign which is usually where all the “stuff” usually happens. While I was hovering around Google Street View, I actually sighted one “No Entry” Barrier somewhere near the ice/wind cave. Do note that every single blog/video online warned people against going beyond the No Entry sign as it gets really dangerous but human nature is weird – the more you discourage against something, the desire only increases which is why there are still so many people exploring beyond the paths. Oh wells. 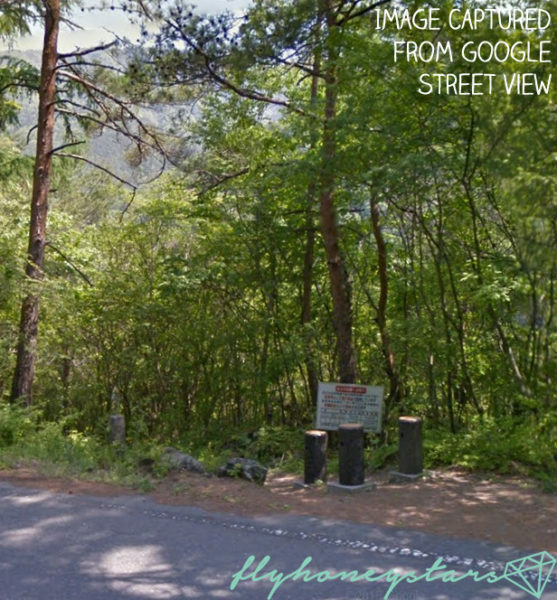 Anyway, the google street view in the forest is pretty amazing. Someone actually walked the routes on foot in 2012 to give us all these awesome images. That’s all I have to say about the suicide forest. If you do visit this place eventually, do drop by to leave me a comment as I am keen to know about your experience too! I believe that every encounter and experience is unique and there’s something that nature can really teach us! Thanks for your comment! Yes it felt quite creepy when we were all alone inside.. but definitely worth an experience to challenge your guts! haha. Hi there..just to know more abt your experience at the suicide forest..can u kindly whtsapp me at X ..my name is Sani..
Hello! I removed your mobile number from the comment.